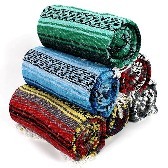 This Deluxe Solid Color Woven Yoga Blanket is a perfect replacement for a bolster. These blankets are Larger, thicker and softer than standard solid color blankets. Approx Dimensions: 78" x 60"
All yoga blankets are considered artesian blankets and are made from new recycled materials. These blankets may contain small tied knots and small imperfections, this is normal and will not impede the blankets use.